PARK SLOPE – At the corner of 5th Avenue and 13th Street in Park Slope this morning, the screen of the giant LinkNYC kiosk flipped back and forth between two pages: an advertisement, of course, and a brand new feature: a listing of bus arrival times. Launched this morning as a collaboration between LinkNYC and the NYC Department of Information Technology and Telecommunications, the bus time pilot program was announced by City Councilmember Brad Lander (D-39), who called for the service in September of last year while unveiling city-funded bus countdown clocks in his district. The new program will display the arrival information—calculated in “stops away”—for all the bus lines within about 1/3 of a mile of each LinkNYC kiosk. Starting on 29 kiosks within Lander’s District 39, the program will roll out citywide in coming weeks. Currently, there are more than 1,700 LinkNYC kiosks across the five boroughs, with a plan for 7,500 total. The Councilmember admitted that the kiosks provide information that’s available on commuter’s phones, but argued that many bus riders don’t bother using the MTA’s mobile Bus Time. This system uses the same data as the MTA’s app, letting the kiosks know how many stops away buses are. At 5th and 13th, location information for the B37, B61, B63, B67, B69 and B103 buses competed for space, letting a passerby know if they had to make a mad dash for an arriving bus anywhere in the area. 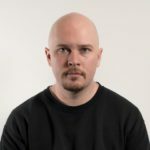 But despite the congratulatory atmosphere, after watching the brand new bus arrival display on the 5th Avenue and 13th Street corner, it quickly became clear the system needs some serious work. Tracking the Brooklyn Bridge-bound B63 bus as it made its approach to the kiosk, useful information was briefly available as the bus entered the Link’s 1/3-mile radius: it’s 4 stops away from 14th street, now 3, now 2, and now 1 stop away as it buzzes past 13th street. In that sense, the kiosks work fine. As each Link in the area displays similar information, the display would be handy to a rider looking at another kiosk further down the line. But waiting at the 13th street corner, a rider would remain in the dark about the next bus for quite a while. 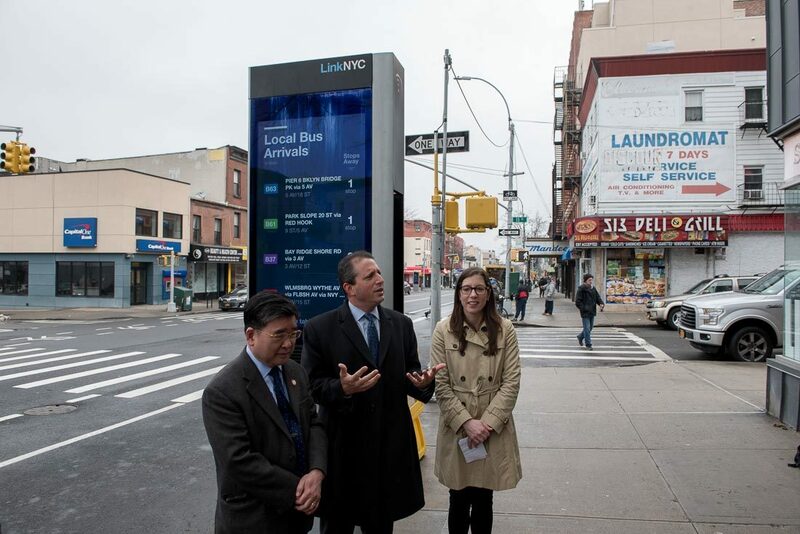 When asked about the functionality, a representative from LinkNYC was quick to state that the kiosk’s displays weren’t for people standing in one place, waiting for the bus, but were instead a quick-glance reference for all the buses in the area. If that’s the case, then the usefulness of the kiosk’s bus arrival displays pales in comparison to the actual Bus Time Countdown clocks, which came to Park Slope last summer. Those displays use GPS-monitoring of buses to accurately display actual times—in minutes—to commuters waiting for a bus. If the goal is to let commuters evaluate their options, perhaps running an errand or choosing to use the subway, an actual countdown in minutes is far superior to the Link’s about a bus that’s always 1 stop away from new stops farther and farther down the road. Of course, Bus Time Countdown clocks cost $35,000 each, while LinkNYC kiosks are installed at zero cost to the city. With 15,000 bus stops in New York City, odds are residents won’t be seeing countdown timers at all of them. Still, the new information on the LinkNYC kiosks is better than nothing. Councilmember Lander acknowledged the “very visible” subway crisis that’s dominated the news cycle, but reminded those gathered about the less visible bus crisis: precipitous drops in ridership and some of the slowest bus speeds in the nation. With buses used disproportionately more by marginalized and underserved groups, it’s important to make any advances towards increased reliability, convenience and ridership, he said. 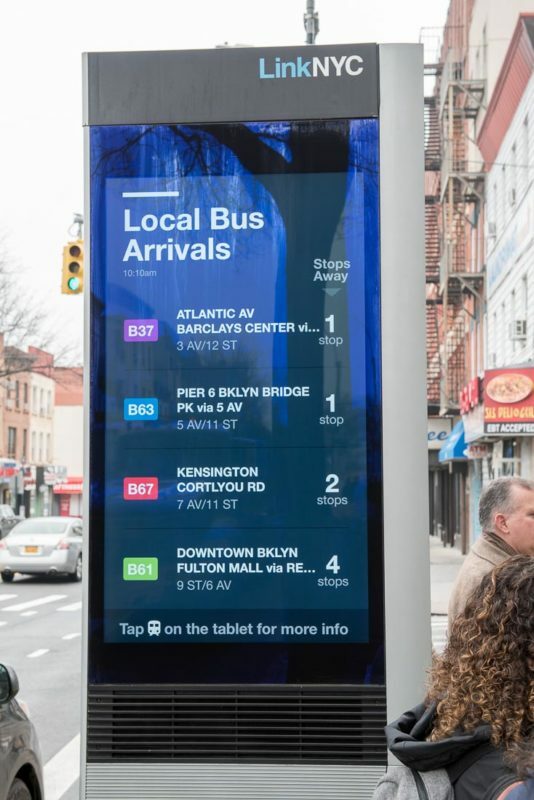 Representatives from LinkNYC did say they’re open to feedback—they’ll be checking to see how the new displays function and how commuters use them throughout the pilot program, using the information to optimize functionality. Hopefully, they’re only a few stops away from a truly useful system. It would be nice if these were installed in other neighborhoods besides Park Slope! How about Marine Park, Sheepshead Bay, the Junction??? The clock at the junction hasn’t worked in months. We also needs some benches at the bus stops in Marine Park. This story made me laugh, in particular the “congratulatory atmosphere” paragraph. I saw this bus feature in action earlier this week and I might have to disagree with you that it is “better than nothing”. If my hunch is correct CityBridge agrees, because it looks like the bus arrival time feature has been removed from the kiosks. Until about Tuesday this week the bus screens appeared as often as everything else in the rotation but I have not seen them since. I’m happy to be wrong but given the confusion this patently useless feature could cause I think getting rid of it makes sense until they can get it right, which will probably never happen. I use the bus a fair amount and cannot think of any value in knowing the overall status of all buses in the area. It’s like this feature was developed by people who do not use the bus, *for* people who do not use the bus. One SMART thing I had noticed today is that subway status screens seem to appear much more frequently during rush hour. It might have been my imagination but if not, and if it’s intentional, that’s … something.